As we wrote last month in discussing LinkUp’s Job Duration metric, as the job market has reached epic levels of over-heatedness, companies have taken to extreme measures to fill positions as quickly as possible, often offering jobs to minimally qualified applicants without even meeting them in person. 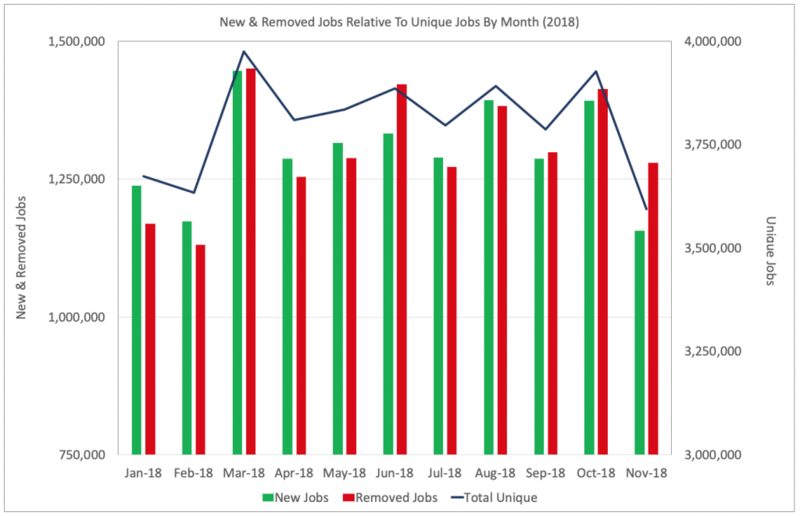 As a result, the lag time between when an employer posts a job on their company website and when they fill the position (and subsequently remove the opening from their site) had been shrinking steadily all summer. As a result, our Job Duration metric declined, dropping from 45 days in June to 42 days in August. As a result, we had to adjust our non-farm payroll forecast model by looking at the job openings in a given month to forecast that month’s job gains as reported by the Bureau of Labor Statistics. 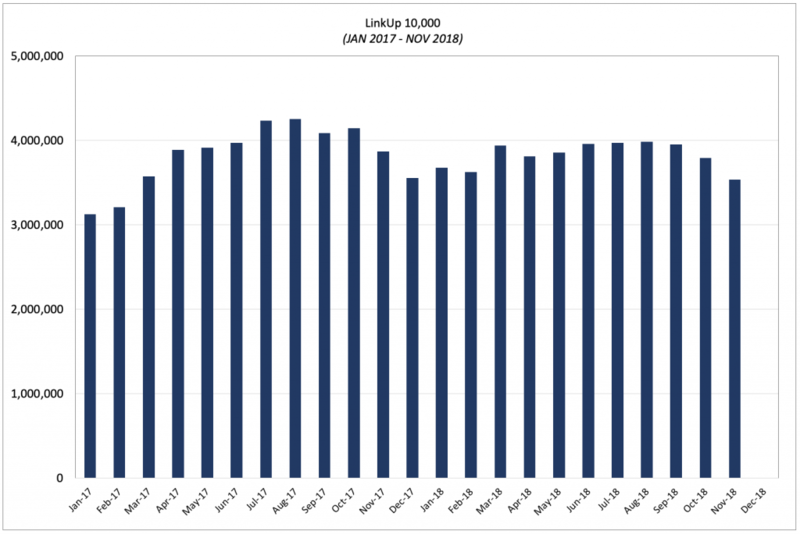 So to forecast November’s Non-Farm Payrolls to be released on Friday, we actually need to look at job listing activity in LinkUp’s job search engine in November. And unfortunately, the data paint a pretty ugly picture. Using our paired month methodology, new job listings in November declined 7% and total job listings declined 2%. 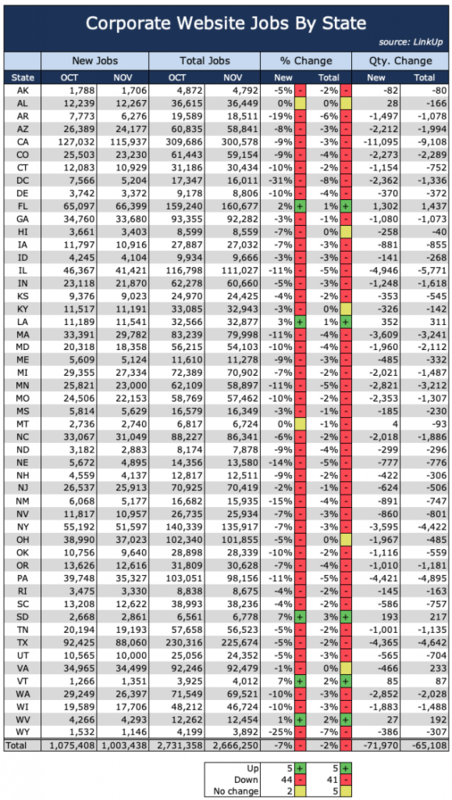 Even more troubling is the fact that declines were widespread across the country, with 44 states reporting declines in new job openings and 41 states reporting declines in total job openings. Looking at total organic job listings on LinkUp in the U.S., the data is equally negative. New jobs dropped by 17% in November and total unique jobs fell by 9%. Jobs removed, which stand as a close proxy for jobs filled as described above, also declined 9% in November. 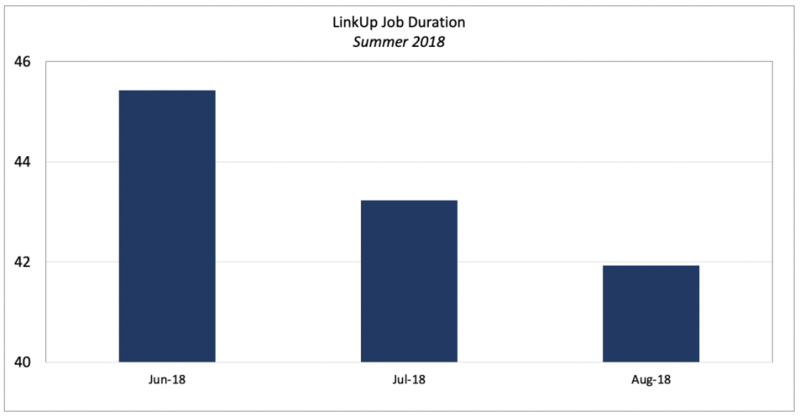 The LinkUp 10,000, which measures the total number of job openings for the largest 10,000 employers in LinkUp’s search engine, declined 7% from the prior month and 11% from the 2018 peak in August. 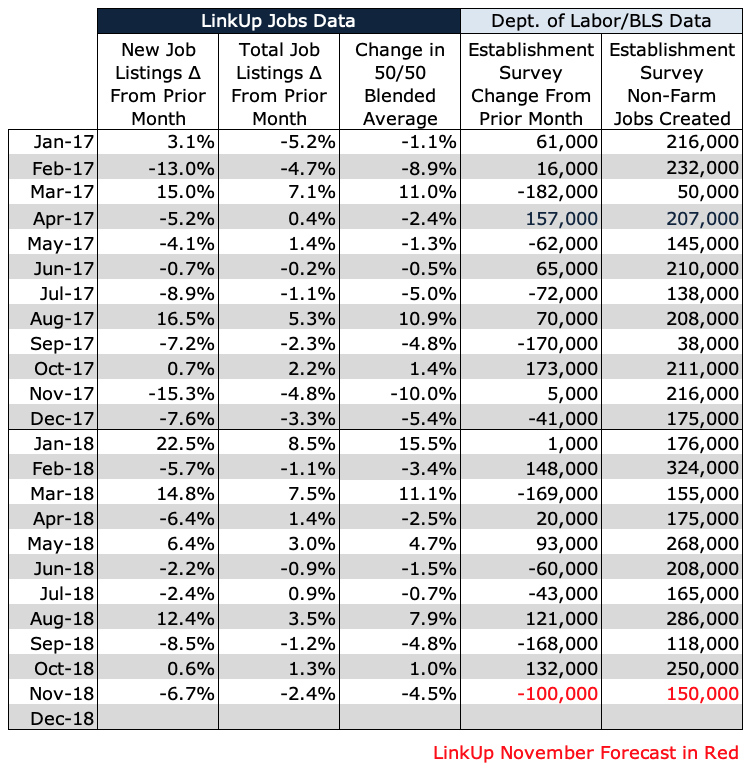 As a result of the data listed above, we are forecasting a net gain of just 150,000 jobs in November, well below the consensus estimate of 205,000 jobs. Given the data we’re seeing in our job market data which, by the way, is sourced every day directly from 50,000 company websites (which means there are no duplicates, expired jobs, or job board pollution), there is no doubt that the job market is showing early signs of cooling off. How quickly and to what extent is clearly an unknown, but our data is overwhelmingly conclusive that labor demand is slowing down and that will eventually result in lower job gains in the official government data. 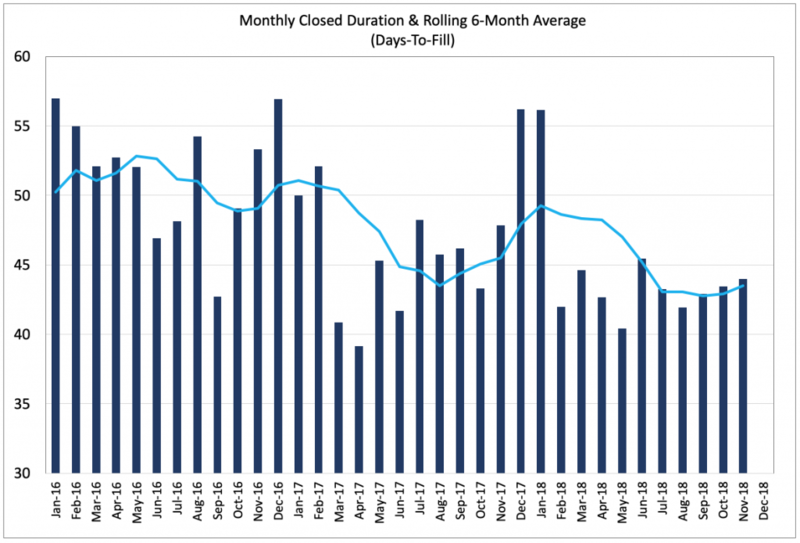 Turning back to Job Duration, the pace of hiring is starting to slow down as evidenced by the fact that duration has steadily climbed over the past 3 months, rising back up to 44 days in November. That decreasing hiring velocity, combined with the decline in job openings in November, provides further ammunition to the argument that the beginning of the end of the historically long economic expansion following The Great Recession might finally be at hand.